my memory of visiting restaurant in Baker Street, to Rorganic. the owners of the restaurant named L’Enclume in Lake district, Canbria. greatly welcomed by the smoke coming out from the skillet. Their label are by the local small artist and they get paid by wine i heard. beautiful black cherries and spices. gamy and earthy yet elegant and subtle. Bread & Butter always presents the face of restaurants. from the top: onion and thyme, pumpernickel, and whole meal. They flavored the beef tongue with grape seed oil soaked in coal. This lollypop is about the size of my pinky finger. Rowan shoot milk shake with Lemon curd brioche donut. and the comfortable size of restaurant almost feels like being invited to friend's house. Thanks Sandia and other staffs for the great and happy service! i surely will come visit you again. President Kato took me to Kaikatei. and used for the dinner party for APEC meetings in the past. "Wing of Japan", Junmai Daiginjo that aged 2 years under zero degrees. The flavor expresses its strength and balance yet as smooth as silk. This sake has been carried in the air-flights for governmental officials. Yamadanishiki and Gohyakumangoku rice, and matured 5 yeras at 5 degree Celsius. makes me forget the length of time passing through. "Ginsen", 1 year matured at 0 degrees. They labeled it as "Tokubetsu Jumai" with its high polishing ratio; 50%. and it went well with wide range of dishes. are vivid and extremely fresh unpasteurized (Nama) and undiluted (Genshu) sake. great served in flute glass. Polishing ration 38% (means 62% outer shell is milled away) Junmai Daiginjo "Tokusen". This was enjoyable warm as well. the best part is: Crab innard and Sake mixture in the crab shell. but It's all mine this time. You can never miss this Sake when knowing Born bland; "Dreams Come True". It is a Junmai Daiginjo sake had stored in -8 degrees for 5 years. he had been making his each dream true by challenging so much of hardships. Pimienta is fully charged to make my sake dream true! and made with the rice milled up to 21%. This sake is only sold by reservation. Am I allowed to experience a night like this? 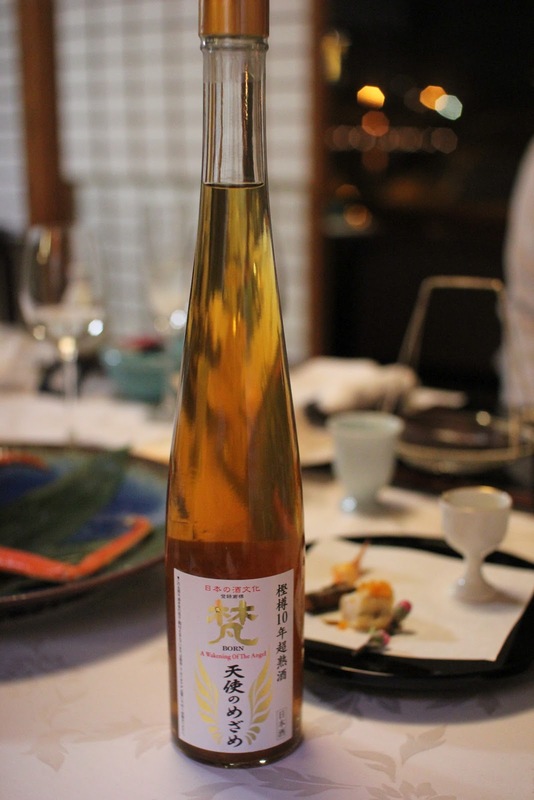 "A Wakening of the Angel", 10 year Oak-Aged Junmai Daiginjo sake. damson, and pineapple, as well as the pleasant toasty bitterness of roasted marmalade. best in the dessert wine glass as digestive or for dessert. yet talks about his love for Born sake calmly and gently. I was very glad to meet him. This is Mr. Akira Hirano, Toji (Master Sake Brewer) of Born sake. He is posing funny in this photo but he is super serious when it comes to sake making. President Kato saw his work in the past, and made exceptional promotion to be the Toji. the conductor of the whole production. With a charming President Kato, whose tie is printed as "Junmai-shu". because Sabae city is famous for eye frame production. a very charming female sommelier and bartender. She made us beautiful cocktails using Born sake. owned by certified senior wine sommelier and sake sommelier Mr. Yoshiyuki Tsukamoto. In this bar, there is a Chevalier du Taste-Fromage, Ms. Megumi Omono. The unexpected encounter with French cheese there made me happy. The salty goat cheese and clean Born sake goes beautiful. The night ended with toasts with all customers at the bar. I felt the power of President Kato's charm and personality, which always attract people around him. to visit Mr. Shata of Tengumai Sake Brewery. as an award of Sake Communicator Award I received last year. I had arrived in Sabae-city, Fukui preefcture to visit "Born" Sake of Katoukichibee Shouten. The photo above is Yoshie Shrine where god of water resides. I heard that most of the remained snow had melted this morning. they have 20% of the world and 96% of the national share in the market. as well as being the sights for beautiful azalea flowers. The face of Born sake, 11th owner and president Atsuhide Kato. last time I saw him at Sake event at Japanese consulate in Shanghai. as well as his looks which you'll never forget once met, he is such a man with impact. After arriving in Sabae, I got a lunch at his place with "Born Gold" sake. when Sake from his brewery had elected to be the official sake in the area. The little boy in the photo is the grandfather of president Atsuhide. and that made me feel the history between the Ginjo sake and Born. "Zubo Gani", the crab which just molted was in season. was so tender and juicy. The sweet, thick and mouth melting prawn almost made me cry. but awoke and made me in panic! I had eaten it all, though. I'd got to see plum flowers in each places I had visited. yet this tiny and sweet invitation of spring made me love Ume (plum) blossoms as well. I was lucky to see brewery even though it was closed on Sunday. and all sake is matured in freezing temperature at least for 2 years. They are one of the top brewery for its high polishing ratio. You cannot see it in the photo, but the bottom of the sake making tank is conic shape. they designed to create the natural convection within the tank. and there are 5 koji rooms with in their 4th floor building. which allows to remove the clothes much easier than reglar design. I felt the lives of bacteria moving in the quiet brewery. focused so much on their tips to work with the fragile delicacy of rice and sake. developing the facility to circulate 99% of used water to underground. and produces sake which "brings visions of the future". President Kato, Thank you so mcuh! with super energetic Kato san at night time.